On Friday evening, my parish had an exhibition of relics to which my family and I went. Relics are an aspect of Christian belief that don't get much discussion nowadays, except perhaps negatively, which is too bad, because the veneration of relics is both an ancient practice and theologically important. The history of the Church is filled with stories of relics, including miraculous ones, reflecting the Bible's own recounting of such things (the man restored to life by touching the bones of Elisha, the woman cured by touching the cloak of Jesus, etc.). And, of course, there's an undeniable degree of luridness to the practice of collecting and displaying the bones, clothing, and other possessions of the deceased. None of the relics I saw on Friday (there were 168 in all) were as impressive as the one depicted above. Almost all of them were tiny fragments of bone (ex ossibus in Latin) or clothing (ex indumentis) placed in a theca, a small, circular, gold container, which in turn was placed in a standing display. The theca (meaning "receptacle" in Latin) is sealed in a special way, using four strings and a wax seal impressed with the signet of an appropriate authority (a bishop, an abbot, or a postulator), and is always accompanied by a certificate attesting to its authenticity. The lack of any of these things -- the strings, the seal, the certificate -- makes the relic dubious and thus not fit for public veneration. During the Middle Ages, the creation of fake relics was almost an industry, thus necessitating the Church's oversight and regulation of the practice, including the banning of the sale of relics. This prohibition continues to this day. In regulating relics, the Church distinguishes between three types. First class relics are either items associated with the life of Christ (like a piece of the Cross, for example -- one of which was at my parish's exhibition) or the physical remains of a saint. The vast majority of the relics I saw were first class relics. Second class relics are items worn or frequently used by a saint. Third class relics are items touched to a first or second class relic. 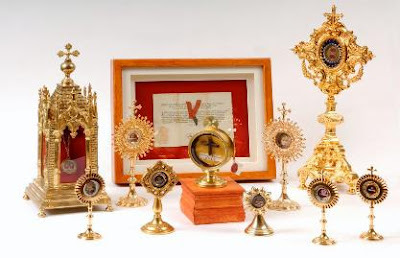 Consequently, many people at the exhibition brought rosaries, crucifixes, and similar objects to touch to the relics on display so as to create third class relics from them. I bring all this up in part because I distinctly recall my surprise as a younger man upon reading the Dungeon Masters Guide and seeing a section on "artifacts and relics." With the exception of the Mace of Cuthbert, though, none of the DMG's items are connected to the life of a saint. As he so often did, Gary Gygax had universalized the meaning of a word for gameplay purposes, so that a "relic" came to mean a potent item associated with the life of a past historical figure. So, we get (to cite a few examples) the Sword of Kas, the Machine of Lum the Mad, the Mighty Servant of Leuk-o (all second class relics by Church standards), in addition to the Hand and Eye of Vecna and the Teeth of Dahlver-Nar (first class relics). None of D&D's relics seem to be the objects of veneration. Rather they're just powerful magic items -- another example of the game's often reductionist appropriation of religion and mythology. But that didn't stop me from inventing my own more saintly relics in my campaigns of old (like the Sword of St. James) and attaching them to pilgrimage sites rather than throwing them in a dragon's hoard somewhere. The structure of the Dwimmermount campaign's cosmology does not (at present) allow for saintly relics, so I don't have any new ones to share. However, that may change in the future, as more of the setting's ancient past is made known through the actions of the PCs, in which case I may return to this topic in earnest. I was fascinated with relics 'back in the day'. Introducing them into a campain was difficult given the power of most of them. One memorable series of adventures involed the characters in a race with an evil NPC who already had the Eye of Vecna and wanted the other pieces. Besides the hand there were rumors of other pieces carrying strong magic such as his socks and underwear. 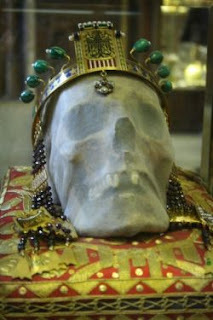 Why doesn't Dwimmermount allow for saintly relics? The prevalent religious structure of the main campaign area doesn't revere saints or their equivalents. I think perhaps one of the reasons we don’t see relics in the game (as defined in Roman Catholicism and Eastern Orthodoxy, for example) is likely because Gygax didn’t consider historical Trinitarian Christianity to be authentic Christianity. He was a self-defined Arian and associated himself closely with the Jehovah’s Witnesses which puts him squarely outside the bounds of historic Christendom. As a result, he likely saw historic forms of Christianity, with their relics, as essentially apostate. I think we often overlook this fact when looking back on Gary as a man of faith. It’s also one of the reasons I don’t see the presence of crosses in Gygaxian D&D as being inherently Christian, since he likely saw them as a pagan symbol co-opted by the historic apostate church (as claimed by the Jehovah’s Witnesses). Thanks for this, a really inspiring post (no pun intended). I grew up in a more or less secular household and didn't know much about relics aside from the notorious counterfeiting operations of the Middle Ages (which are parodied quite humorously in an early episode of Blackadder). I by no means want to make a direct comparison here, but by analogy, I know I get somewhat awestruck in the presence of historically significant objects, for example this 1890's hand-crank Cinematographe movie camera they have at the Eastman House in Rochester near where I live. So I can only imagine how it must have felt to be in the same room as a fragment of the Cross. I think I'd be totally blown away, and very humbled. Good post. Looking forward to a post on how you used this in your games! Perfect timing for your post. Yesterday I put up a post on my blog asking for suggestions for my next series of posts for my Shatterworld campaign blog. Two of the suggestions were spotlights on specific cultures, and legends. I had decided last night that when I woke up this morning, I was going to do a little research on live of the saints, as I wanted my first post to be on how clerics fit into the campaign world, and create some legends concerning famous clerics, who I view as prophets or saints in my world. Adding relics and pilgrimages into the mix is the perfect icing on the cake. "Rather they're just powerful magic items"
To be fair, real-world artefacts and relics are almost all regarded as magic items of varying degrees of power (and some are supposedly very powerful indeed - think Ark of the Convenant). The only difference is that their magic doesn't actually work. So, it's not quite as simple as Gygax's "reductionist appropriation" of a real-world thing. I am first time commenter and I would like to thank you for this post. I am browsing for information for filling a little patch of void in my personal ever-changing setting. And this gave me really good inspiration based on my common knowledge and setting's cultural environment. I am from Bohemia - we have a lot of historical relics, but our culture in meaning of religious awareness suffered a lot from 40 years of communism - we are one of the very few most atheistic nations worldwide, or even worse anti-religion zealous, theophobic. If you're ever in the northeast, you might consider a visit to St. Benedict's Abbey in Still River, MA. The monks have a "relic room" with what seems like hundreds of relics lining the walls. It's one of the largest collections of relics in the country, and quite an astounding display. Our parish is very fortunate to have a relic of the Cross in addition to several other 1st Class relics of various saints. The most impressive reliquary vault I've personally been in is at St. John Cantius in Chicago. They have a HUGE room off the Gospel side of the High Altar there with several very large reliquaries containing hundreds, if not thousands of !st and 2nd Class relics. As to the purported "fabrication" of relics in the Middle Ages, I've long suspected that's propaganda. Since competent ecclesiastical authority can authorize the "manufacture" of 3rd Class Relics, it's not inconceivable, contemporary lampooning not withstanding, that most of the "fake" relics were, in fact, 3rd Class Relics. As to the oft-repeated claim that there are more fragments purported to be of the True Cross than [insert whatever vast wooden structure you like], competent investigations repeatedly conducted over the last 200+ years have concluded that there are barely enough fragments to "reconstruct" the cross-beam. @Nagora, as to whether or not the "magic" works, relics can, and do, heal people miraculously in both body and soul. They continue to do so even today. The Church is very skeptical when investigating purported miracles, unlike the news media, and reserves judgment until a thorough investigation is concluded. My own feeling is that there must have been enough fakes in circulation (and on sale) that the Church saw the necessity to regulate their authentication and forbid their sale. My old canon law teacher taught that it's rare that laws are enacted against crimes that aren't extant. Ugh. There really aren't enough relics in my games. Good food for thought here. As a non-Catholic, I used to chuckle at the veneration of such 'stuff.' I thought it was so not-modern to put stock in things just because they belonged to someone important. Then I saw a photograph of a girl shoving a clump of sod into her mouth because Ringo Starr had just walked by and stepped on it. So went my thinking that we had grown out of such things. Looks like a great display. I'd be interested in seeing it myself. FWIW, I noticed the same thing about such artifacts and relics as we started our D&D campaign. I decided to divide them into two categories: Artifacts (which are just ancient and legendary items of great power), and Relics (which are the same, but have a level of veneration about them because they are connected with the stories of the faithful). While I have developed minor ones here and there, I used several from the DMG and placed them in certain places for pilgrimage (such as the Coat of Arnd at Veluna City). In fact, the party just recently got to see it in all its magnificence at the monastic community there, closely guarded and warded, but visible to pilgrims. Real-world artifacts & relics are undeniably fascinating whether one believes in their purported powers or not. And, in game-worlds where artifacts & relics likely do have such powers, they should be even more important to those worlds' religions than they are to any real-world religions -- especially to those game-world religions that already worship idols or, at least, don't forbid idol worship. That was a great article, James. My first experience with relics was in second grade when the nun who taught our class brought in a theca with a relic from St. Theresa. I remember being slightly disturbed but at the same time morbidly curious about it. It looked like it was part of an earlobe or something. As he so often did, Gary Gygax had universalized the meaning of a word for gameplay purposes, so that a "relic" came to mean a potent item associated with the life of a past historical figure. Great post. I would like to incorporate more relics into my game, but I need to get the players interested in the religions of my world first, otherwise they would just be powerful magical items. "I would like to incorporate more relics into my game, but I need to get the players interested in the religions of my world first, otherwise they would just be powerful magical items." You're thinking about it backwards. Artifacts & relics can be a WAY to get players interested in the religions of your world IF they're powerful magical items that work ONLY for practitioners of the religions they're associated with. One thing to think about with relics is the idea that they can "power" a magic item. The one that sticks in my mind is Durendal from the Song of Roland; it is supposed to have had a tooth from St. Peter, blood from St. Basil, hair from St. Denis, and a piece of the Virgin Mary's raiment, all in its hilt. I think that's a pretty good description of a "relic-powered" magic item, and one of legendary capability - it was supposed to have created La Brèche de Roland when he tried to destroy it. I'd venture that this would make a much more game-ready artifact or relic than a piece of bone stuck in a theca.